It is the mission of Father Andrey and the St. Andrew Russian Orthodox Church to be a visible presence of Christ in our culturally diverse community, rooted in faith and nurtured by prayer. We commit to work with the poor, the powerless, and the oppressed and celebrate God's unconditional love for all. 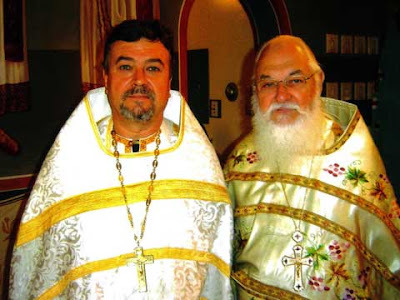 On July 30th, 2009, the Russian Orthodox Church sent a written decree of approval and support to Father Andrey and the St. Andrew Russian Orthodox Church. The decree is an official document which blesses the receiving church with the full and unconditional support of the parent church. Click on the image or "Decree Letter" in the left column to see the decree letter. Most references to Andrew in the Bible simply include Andrew on a list of the Twelve Apostles. Having met Jesus, Andrew then finds his brother Simon and brings him to Jesus. Andrew is instrumental in bringing others to meet the Saviour. The Fellowship of Saint Andrew is devoted to encouraging personal evangelism, the bringing of one's friends and colleagues to a knowledge of the Gospel of Christ. St. Andrew is honored as the chief patron by both Russia and Scotland.